The right to strike and withdraw our labour, the right to say “no”, is a fundamental and basic human right that has been eroded in Australia, and too often completely denied. As an issue important to many RTBU members, most recently, the union hosted and supported meeting of rank and file unionists across the movement to further develop and support the campaign. This is a conversation occurring at all levels at unions across Australia with rank and file members key to identifying and finding solutions to these problems. Thanks to all those who have called and/or emailed me to discuss ideas and experiences. The difficulties in EA bargaining with V/Line and the barriers put up by both the Fair Work legislation and the company to spoil member’s capacity to fight, and our lack of options to defend against attacks between bargaining periods (consider V/Line’s unsolicited attacks on conditions under the guise of “a new vision for training”). Currently it is illegal for workers to take industrial action outside of Enterprise Agreement negotiations. Needing to give sometimes 3-5 days notice to the employers even within a bargaining period gives corporations too much power to manage the impacts of industrial action. This often means that labour hire workers and non-artisans are too easily replaced by supplementary labour making it very difficult to hold large profitable companies to account. The unchecked powers of a government or minister to apply the “Fair Work” Commission to terminate protected industrial action democratically voted for by union members. 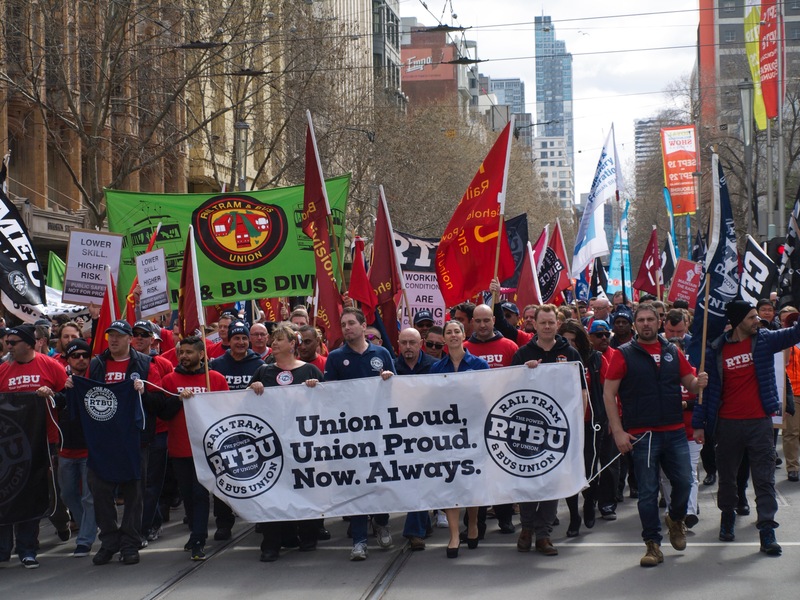 This was the case in the Metro Trains Melbourne Operations Enterprise Agreement where the RTBU had to fight both Metro and the State Government to defend the basic right to withdraw our labour. These issues have been naturally compounded in recent years through the efforts of anti-worker Federal Minister for Employment Michaelia Cash providing support to companies looking to steal working conditions and attack wages, and the Minister for Public Transport Jacinta Allan trying her best to look “tough on unions”. While we were successful in fending off this challenge in Victoria, our comrades in New South Wales at Sydney Trains were less successful, having their industrial action completely terminated. If you ask the bosses, they’ll tell you that this system is working beautifully. “A well oiled machine” they might say. But the reality is that this sample of issues in our back yard (the tip of the iceberg) is exactly why Unions are banding together across the country to change the rules. In the current ongoing struggle between Victorian workers and global oil and gas giant Exxon Mobil, the workers at Esso Longford have been indiscriminately sacked and offered their jobs back at lower pay. This is the same technique used by CUB when they sought to use this system to slash wages at the brewery in Abbotsford. These workers have had injunctions placed on them and seen alternative labour crews brought in to do their jobs. This strategy of terminating enterprise agreements was first tested by the bosses at Aurizon rail in Queensland and has been exploited by employers across the country ever since. If we are to be deprived of a genuine right to strike, and then also face the potential to have our long negotiated enterprise agreements terminated, it is clear the rules are broken. 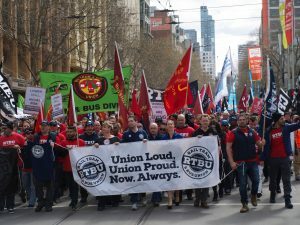 The Australian Council of Trade Unions (ACTU) held their triennial congress last week where these issues were discussed through a national perspective, identifying what issues have been encountered by unions across the country, building on the campaign to Change the Rules. With unions all united on this campaign, the corporations that think they govern Australia are on notice. Workers and unions understand the power of unity when fighting a common enemy. Whether it be against an individual manager, company, an employer association or a government looking to undermine workers rights and conditions, unity and commitment to the fight is what will deliver results. Corporate Australia has always sought to kick workers and their unions around, but united in our message and strategy we will fight them as one big “well oiled (justice) machine”. The boot is now on the other foot. We know how to fight and we know how to win.